RECONNECTING is an essential novel for our times. Katalin Kennedy expertly weaves a captivating story about how the bonds that women experience guide their choices -- and ultimately destiny -- through relationships that can be as messy and wondrous as life itself. As we get to know Marlie and her enquiring mind, her pondering of crucial issues and ensuing flashes of insight reveal how love and friendship, with a good dose of providence, can guide our lives and lead to wisdom. This book is as heart-warming and comforting as a good feast for the soul. We are left wanting to share more time with Marlie and her distinctive friends. Katalin (András) Kennedy escaped from Hungary with her parents on Christmas Eve 1956. She married Duncan Scott Kennedy in 1972 and graduated from Ottawa’s Carleton University. In the latter part of her career, she managed major national projects with Health Canada’s Family Violence Prevention Programs, until her retirement. Her beloved soul mate, the Rev. D. S. Kennedy passed away in 2006. She now resides in Cornwall, Ontario and continues her involvement in various organizations: Canadian Federation of University Women, Probus Club of Cornwall and Area, Encore Seniors’ Education Program and the Cornwall and Regional Writers’ Society. For ten years she was a columnist for Seaway News. 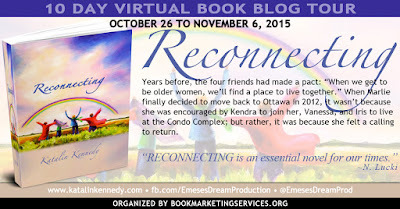 In 2012, Kennedy launched her first novel “The Women Gather” and in June 2015 “Reconnecting” was also released by Baico Publishing. Katalin: I’ve written from the time I was very young. My father was a book binder; he bound a large size book of many blank pages for me when I was around ten. I started to write in it: poetry mostly, but some of it was about my impressions of people and events around me. Because this was already in a ‘book’ form, I think I began to have the desire to be a writer even then. I enjoyed reading from my first English language story “Peter Pan” in grade two. (I had just arrived as a refugee from Hungary.) And I also liked “Trixie Belden” stories. I remember saying “I can write about Trixie’s adventures!” and proceeded to write my own storyline, at about twelve. I studied Literature at university; and did some writing through my work-for-pay career. It wasn’t until I retired that I took up writing ‘legitimately’ which included a monthly column for Cornwall’s Seaway News. My first novel, “The Women Gather” was published when I was 64. 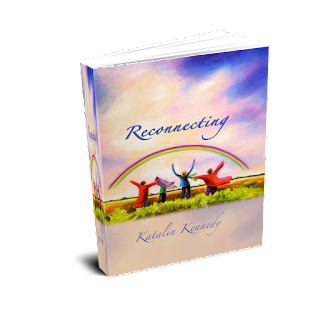 Quite frankly, it wasn’t until my second, new novel “Reconnecting” was thankfully accepted again by Baico Publishing, that I now finally feel like a bona fide ‘writer’. Katalin: If you ask my friends, they would surely say ‘forever’, because they are anxious to read my next piece. My first novel did take a long time, partly because in the midst of writing it, my husband passed away. It was several months before I felt I could return to the work, and then only sporadically.“The Women Gather” is told through journal articles, diaries, letters and videos; this style allowed me to write ‒ when I had the inclination, without disrupting the flow. I was at it likely over four years. 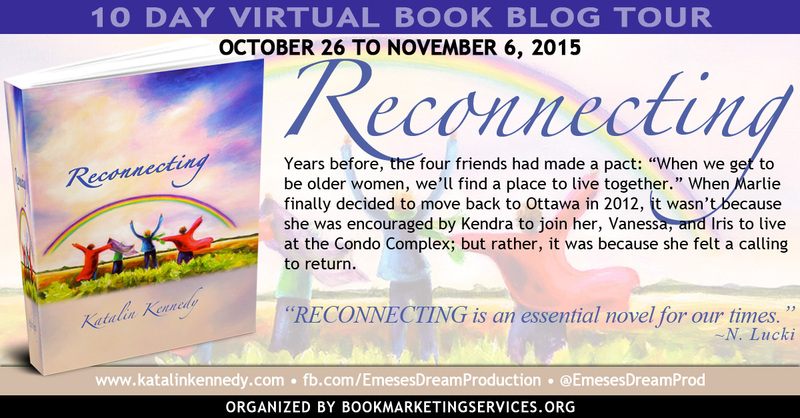 My new novel “Reconnecting” was written during parts of two years. It is the story of four older women who choose to live together in a Condo Complex in 2012 Ottawa. Question: What is your work schedule like when you're writing? Question: What would you say is your interesting writing quirk? Katalin: I’m not sure this is a quirk or just a habit. I have a small office with a desktop system; but the office is tucked away upstairs in the far corner of my house. I do my ‘fix up work’ like editing there. I prefer to conduct my routine novel writing from my laptop, downstairs at the dining room table. Being somewhat obsessive from the ‘tidiness’ perspective, I have to set up the work area each day that I will write there: this includes having my coffee and tablet within arm’s reach ‒ and often my supportive cat. I rather like this setting up process, because it is an affirmation that I mean business. Question: How do books get published? Katalin: It took a long time to have my first manuscript published. I sent it to an editor whom I knew through my work life; the process took an entire year of three peer reviews and final rejection. When one has that happen, the self motivation becomes extremely low. The editor did forward the comments from the reviews. After I got over soothing my deflated ego, I incorporated some of the points they raised. I was next encouraged to ‘self publish’. To my good fortune, however, Baico Publishing accepted my novel “The Women Gather” and released it in 2012. When my current novel, “Reconnecting” was completed, Baico again accepted it, thanks to President Raymond Coderre. Both Ray and Vice-President Stephanie Bertrand are a joy to work with. They give new writers the opportunity to have their novels see the light of day. Question: Where do you get your information or ideas for your books? “Reconnecting” reflects most of what I said. The storyline of four older women echoes back to the time when I began to work; my first position was with Seniors’ Programs, in the Canadian Federal Government. At twenty something, my perspective about aging was clearly idealistic. But even then, I knew about the challenges that older women, living alone faced. Now an older woman myself, I believe we are vessels of a huge amount of knowledge we have learned and experienced throughout our lifetime. Mostly, I recognize that we are never too old to contemplate and further learn, both about the past and the future. Question: What do you like to do when you're not writing? Katalin: When I retired and moved from Ottawa, the capital city of Canada, to a small town Cornwall in Ontario, I had to reinvent myself. I joined a good many organizations which represent various fields of interest. I did take on Board functions in a number of them. All this served me well, to meet new people and become a member of my new community. This continues to be a significant aspect of my life, particularly since my husband’s death. I also continue to enjoy travel, theatre, education and the company of good friends. Katalin: I’ll speak about my 89 year old Mom, who used to be an avid reader. Two decades ago, she was diagnosed with macular degeneration. When my first book was published, she wanted me to read it to her, which would have been difficult as she does not live nearby. I therefore read the novel into a digital machine – which she plays, over and over again. I also recorded “Reconnecting” for her. Her words of support to me are probably the most cherished of whatever anyone else has said, or will ever say. They are beyond exhilarating. Question: What was one of the most surprising things you learned in creating your books? Katalin: I know there are many surprising aspects. The most rewarding for me is the fact that the characters and storyline begin to take on a life of their own. How does that magic happen? These meanderings, however, are a double edged sword. The author better have a good outline as to what s/he wants the characters and storyline to convey. If a plan is not there, who knows where the magic will lead? Question: How many books have you written? Which is your favorite? Katalin: I’m working on a third novel. As with one’s children, I don’t have a favourite. They are each unique, representing a time, when that particular novel was the world and thought my mind created. The latest work tends to be the most immediate, as it is still fresh in one’s memory. Question: Do you have any suggestions to help me become a better writer? If so, what are they? Katalin: Read and learn from the work of others. I belong to the Canadian Federation of University Women’s book club, here in Cornwall. The monthly meeting brings us together to discuss books, I may never have considered reading. From these, I learn about different styles of writing; how characters are presented; how the storyline works or doesn’t. And, often times reading the work of others gives me confidence that what I’ve written is alright. I will always continue the learning process. From “Reconnecting” I came to appreciate the challenge of personal editing such matters as ‘word repetitions’. And this next time, I’m adding ‘sentence structure and variation’ as something about which I want to be alert. Question: Do you hear from your readers much? What kinds of things do they say? Katalin: I live in a small community, and thus, I have a good number of people who are my immediate readership. I do hear comments that my writing ‘flows’. And, that most enjoy the characters. Occasionally someone will point out they appreciate the research and messages. My personal frustration is when people tell me: “Oh it’s soooo YOU!” I do find this dismissive of the work. I don’t believe this kind of response would be forthcoming from strangers. I can, nevertheless, overcome such well intentioned feedback, when the same person will say: “I soooo related to the experiences of one of the characters”. The reality of having a book published means, the author has to let it go. Yes, one is vulnerable to reviews, from whatever source, but then, no one forced one to write ‒ except perhaps one’s own ego. Question: What do you think makes a good story? Answer: I didn’t begin to write a novel until after I retired. Having read some of the great epics of all time, and now with the world wide web at my fingertips, what else is there left to say? It has all been said. And then a dear friend reminded me: “But YOU haven’t said it.” To some extent that message reiterated what a professor once told me: “Write about what you know.” These are important keystones for me. It’s not that I write about me (which some acquaintances seem to assume), rather I write about emotions I have felt, and experiences to which I or people whom I know, may have been exposed. It is some of this that I weave into the traits of characters and their stories. No matter how ‘far removed’ from what we consider reality to be that a storyline may take, it still needs to transmit a relational trigger for the reader. From the very first page of “Reconnecting” my publisher said he was there. He could relate to what the words conveyed. That becomes the page turner. That is what makes a good story. Question: As a child, what did you want to do when you grew up? Katalin: I always wanted to be a teacher. I remember that clearly. I planned to stay on at university and teach there. I met my husband there, and true to the negative stereotypical comments about women at the time, I also earned my MRS. Then out of necessity, I got a ‘job’ in social service programs. I think I have finally come full circle. I write! And through that, hopefully I do teach. Question: What Would you like my readers to know? Katalin: Writing is a joy. Anyone these days can write. Blogs are at one’s fingertips. 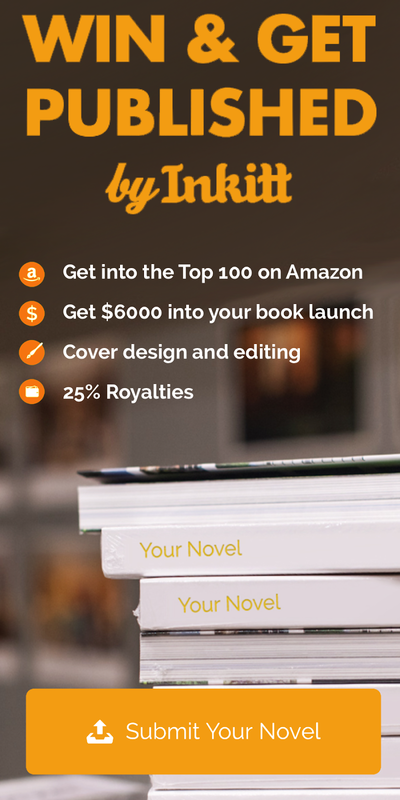 Self publishing is an option. Ebook writing is accessible. And, there may still be a few independent publishers such as mine, (Baico Publishing in Ottawa) who give new writers a chance to share their work. Family histories are so important. I convey that in “Reconnecting”. Each of the four women: Marlie, Kendra, Vanessa and Iris have an interest in the past; it is through their past stories that they come to accept their reconnection with each other. We long to know about our heritage. When I consider how the written word has endured for thousands of years, I see that as a legacy human beings have left behind for future generations. Writing need not be the ‘Great Canadian Novel’ (which I still long to perhaps write some day;o) Personal stories have merit if only for one’s children and grandchildren. Marlie, the main character in “Reconnecting” is a writer; she and I share a similar view on this. Life is fleeting. We are here on the planet for only a moment. I want to leave a part of what I think, behind ‒ to prove I’ve been here ‒ and that I had something to say. If that is hubris, well, I’ll just have to live with it. I hope the readers enjoy “Reconnecting” as much as I enjoyed writing it. Thank you again for hosting this my second novel on your web site. All the best! 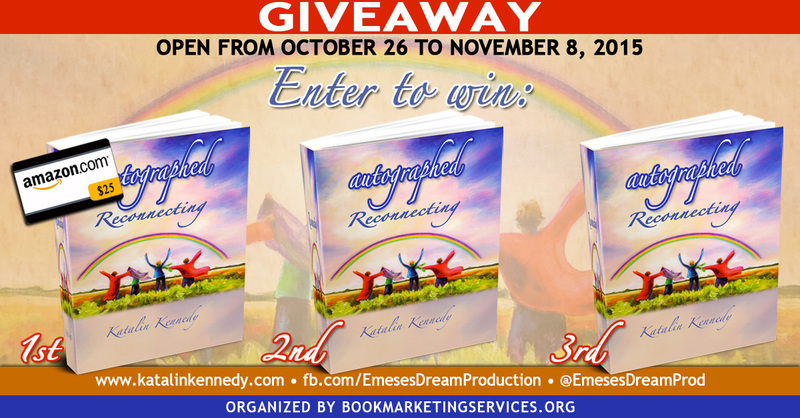 On behalf of Katalin Kennedy and Book Marketing Services, I would like to thank you for hosting and interviewing Katalin today on Deal Sharing Aunt. If anyone has any questions and/or comments they would like to share Katalin will be by later in the day to respond. 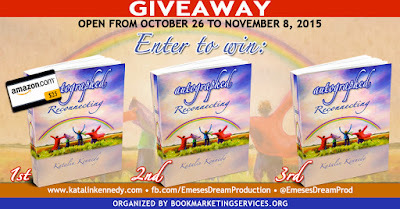 Please join Katalin Tuesday, Novemer 3rd, 2015 for Team Author’s review of Reconnecting http://teamauthor.com/.